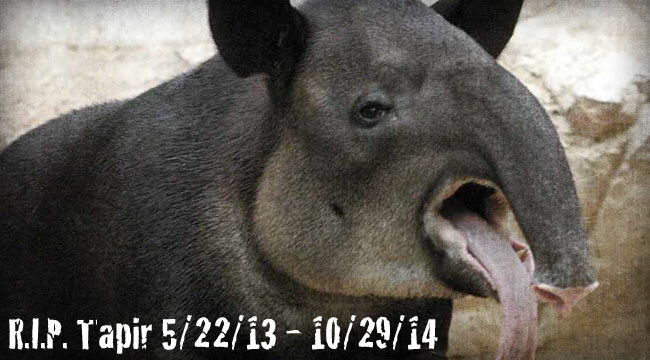 On October 29, 2014, 2:00 p.m. EST, the Tapir – our beloved ungulate – passed away of natural causes. He was born at East Capitol St. NE & First St. SE, Washington, D.C. He was nearly one and a half. A devoted brain-child of loving but misguided Federal Reserve Chairman, Ben Bernanke, he was first spotted in the digital pages of the 5 Minute Forecast on June 24, 2013. Though he left the economy in no better shape than that in which he found it, he did his duty without grumbling, bringing the Federal Reserve’s $85 billion per month asset purchase program, QE, to a slow and painful end. While he was not long for this world, his zero-sum impact on the economy will forever be mis-remembered by those who knew him least. For those who knew him best, the Tapir was simply a large, herbivorous mammal with a prehensile snout, a voracious appetite for berries and a penchant for keeping traders up at night. 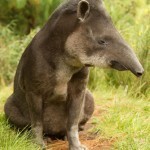 Since being introduced to the world on May 22, 2013, economists and financial pundits have insisted that the Tapir was vitally important to the health and security of the U.S. economy. No one is exactly sure how a pig-like animal from Central and South America can impact financial markets, but according to Mr. Bernanke, he was somehow solely responsible for bringing U.S. monetary policy “back to normal” over the past year and a half. His loss will clearly be felt by all who thought they knew him. He is survived by his caretaker Janet and his estranged relatives Money Printing, Operation Twist and QE4 (due in Spring 2014). For funeral arrangements, please call the Federal Reserve Board at: (202) 452-3000. In lieu of flowers, donations will be collected for the benefit of the Baird’s Tapir Rescue, Rehabilitation, and Re-introduction Center in Nicaragua, located just 159 miles from our own Rancho Santana. Ed. Note: Though he first appeared in The 5 Min. Forecast back in June of 2013, we’ve also been tracking the Tapir’s movements very closely in the Daily Reckoning email edition. And though he’s now deceased, there are those who think he may one day return. Our resident currency maven, Jim Rickards had more on the subject in yesterday’s issue. In fact, several voices chimed in to discuss the impact (or lack thereof) that this creature has had on the U.S. economy… and what it means for your personal investment future. Don’t miss out on any of the unique and entertaining insights you can only find in the Daily Reckoning e-letter. Click here now to sign up for FREE.